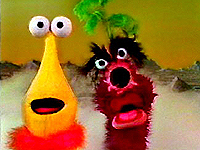 Brian Henson: "Hi, I'm Brian Henson. 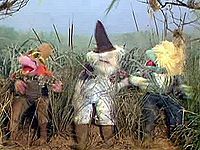 When you watch The Muppet Show, it's the only show on air where you're actually only seeing the top 18 inches of the action. And in a lot of ways, what goes on underneath the camera frame is just as exciting and sometimes more exciting than what's going on in front of the camera." "You think about it. This is the way it is. The camera's shooting basically from the top of your head up to your hand and that's the way all the performers are working. They're all watching monitors to see what the camera can see and it's great fun watching the performers underneath, watching them jockeying for position and people reaching between each other trying to get to an arm rod. It's really a bit like watching a pit stop at an Indy 500 race. It's really quite impossible which is what makes it so much fun to do. Here's The Muppet Show." Fozzie's joke: "Hey, did you hear the one about the kangaroo that comes into a store and a hippopotamus comes out and he says to the kanga..." (Curtains close) "...HEY, I WASN'T FINISHED!" 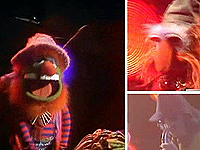 Gonzo's gong: Crazy Harry sets off an explosion. Fozzie welcomes the audience to the show much to Kermit's surprise. 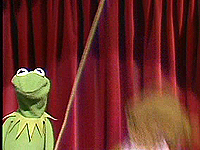 Claiming the frog's working too hard, Kermit has a surprise of his own for Fozzie when he activates the trap door. OPENING NUMBER - "MISSISSIPPI MUD"
STATLER: Bravo! Oh bravo! Wonderful! Just wonderful! WALDORF: How would you know? You're not even facing the stage? STATLER: Why did you have to tell me? I was having such a good time! The Jug-band races offstage (not wiping their feet) and trample Kermit in the process [All five come by even though only three were onstage for the number!] Inspired by Phyllis Diller's freewheeling attitude about her facelifts, Hilda decides it's time for her to look her best. SCOOTER: Is it possible Hilda's 35? 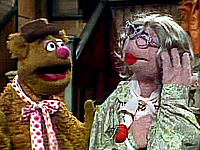 FOZZIE: Only around the waist! 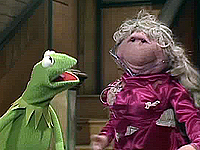 Kermit brings on the zany Phyllis Diller noting that she makes the Great Gonzo look like Sir Lawrence Olivier! Phyllis walks into piano bar hoping to drown her sorrows. 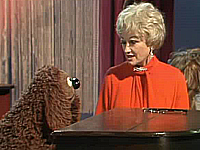 But with Rowlf at the piano, she's not going to be able to do so in solitude or silence! The two commiserate with self-depreciating one-liners. ROWLF: You think that's bad? The first three months of my life there was a newspaper strike! WALDORF: What a performer she is! WALDORF: You've forgotten too huh? STATLER: Whoever she is, she's every bit as funny as Phyllis Diller! Hilda tries on a long red wig. HILDA: They won't even recognize their old wardrobe mistress! KERMIT: Hi, Hilda! Hey the opening number costumes are downstairs - could you bring them up here please? The Newsman interviews Beverly Shepherd (Diller) who flew to Dallas Texas from Mobile Alabama after strapping homemade wings to her body and finds her secret to be less than astonishing. Zoot blows his own horn and offers unsolicited romantic advice/health tips to some pigs while Waldorf surprises Statler with some dips. UK SKIT: MUSICAL NUMBER - "LAZYBONES"
Dr. Teeth plays piano and sings a nice smooth jazz piece backed by the other members of The Electric Mayhem (except for Animal). 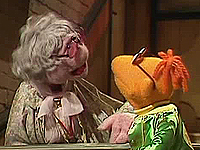 Fozzie takes over from the frog (this time with permission) and receives comedy tips from Phyllis. 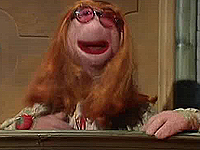 Phyllis discovers that Fozzie's main problem is that he's afraid to tell any jokes that aren't true-life because he doesn't like lying to the audience. PHYLLIS: Small apartment joke...I live in an apartment so small the mice are hunchback! FOZZIE: I've got a mouse but he's not hunchback. He's got the gout. OH WAIT WAIT! I understand now! ... I live in an apartment so small...my mouse has the gout! MUSICAL NUMBER - "HUGGA WUGGA"
STATLER: I'm not your son and my name's not Shine! WALDORF: And he calls ME an old fool! Wearing makeup and a new wig, Hilda is excited over the beauty tips she received from Phyllis. Unfortunately the towels are the only changes the other Muppets seem to notice. FOZZIE: Hilda, Hilda! It is great. The change is wonderful! ... Oh sure, those dressing room towels have been dirty for a week. It is wonderful you changed them. Phyllis shows Gonzo the results of her pocket camera. 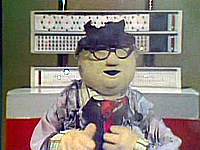 Dr. Bob discovers his patient is a loaf of talking bread. NURSE JANICE: Dr. Bob, what do you make of it? DR. BOB: What else? Toast! Hilda finally succeeds in turning Kermit's head with more makeup, longer wig, red dress, and "very tight foundation garments". Unable to withstand the pressure, they finally end up resembling Bunsen's explosive clothing. 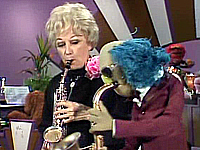 Kermit introduces Phyllis Diller in concert with the Muppet Orchestra. 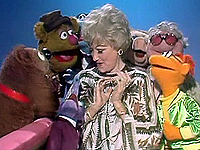 MUSICAL NUMBER - "THE ENTERTAINER"
While Kermit attempts his goodnights, Phyllis finally helps Fozzie find comedic success with a physical slapstick turnaround. WALDORF: OOOHHH!! I HATED IT!! !